Becoming a certified professional and expert in the field of hypnotherapy is possible by enrolling in the hypnotherapy certification program which is now part of the many offers of Brainmeasures. The hypnotherapy course offered by this highly reputable company makes it a point to instill in the minds of its participants the basics of performing hypnotherapy and how to achieve the best results out of it. The kind of hypnotherapy training which you can get from this certification course will surely let you understand the effectiveness of this process and its power when it comes to providing the best treatment to certain conditions including those that affect one’s mental and psychological health. This will allow you to understand all the major benefits of the process as well as the basics of making the most out of it. You just need to complete the hypnotherapy certification course in order for Brainmeasures to furnish you with your certificate which is capable of showing your skills and expertise in the field of hypnotherapy. What kind of preparation do you need before carrying out a hypnotherapy session? 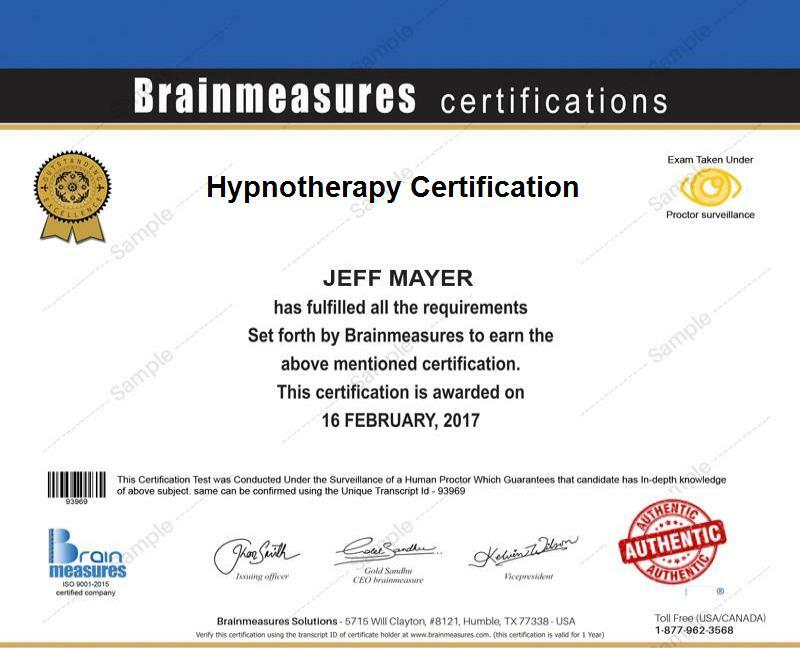 The hypnotherapy certification program which you can now access at Brainmeasures is a major help to a wide array of individuals and professionals especially those who are greatly interested about mastering hypnotherapy. This certification course is most suitable for psychotherapists, counselors, life coaches, NLP practitioners and psychologists who plan on adding hypnotherapy into their skill set and wish to enter the rewarding and exciting world of hypnotherapy. Your salary as a hypnotherapy certification holder can be expected to be more stable. Upon completing your hypnotherapy certification course, you can start practicing your skills in the field of hypnotherapy by working as a hypnotherapist. This will let you receive around $64,000 to $104,000 per year. If you work as a clinical psychologist, then you can expect this to let you receive an annual salary of $81,000 to $172,000. You can also use your hypnotherapy certificate to improve your skills as a psychiatrist and enjoy an annual salary of around $65,000 to $185,000 per year.